In recent years, 3D printing has become extremely useful in manufacturing—and, more specifically, in plastic injection molding. Injection molding companies often use a 3D printer to create a part from a model, drawing, or concept plastic part. Depending on the size and complexity, it can take anywhere from 20 minutes to 48 hours to create a single 3D-printed part—but in most cases, you’d be able to hold a finished replica of your part in a matter of hours. You get to examine a physical replica of your part before you go into mass production, instead of relying on a drawing or concept. You can see how your multiple plastic parts fit together and make any necessary corrections before your molding partner cuts an expensive piece of steel for your injection mold. Your injection molding partner can consider potential issues before your product hits the manufacturing floor. For example, the plastics expert could bring up any potential issues with the way plastic will flow through the mold to create your final part. 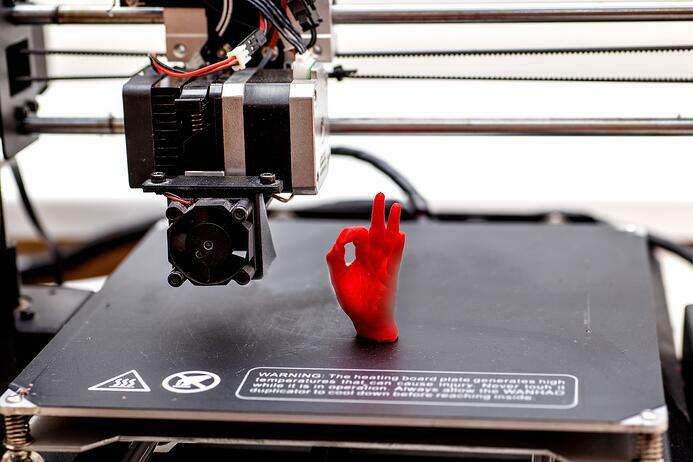 3D printing is evolving rapidly—and we’re expecting big changes on the horizon. Here are three areas we think will revolutionize how 3D printing (also called additive manufacturing) will impact the plastic injection molding industry. One major development in 3D printing today is the ability to print a plastic injection mold. Today’s 3D molding technology does not have the narrow part tolerances required to create a plastic injection mold that can withstand high volume, but we expect this to change in the near future. Once part tolerances are solved, 3D mold-making will become a more viable option—and will have a number of benefit. For example, you cannot drill bit around a corner inside a block of steel—but you can can create virtually anything you imagine with a 3D printer. Additionally, the material used to create a mold in a 3D printer is less expensive than high-grade steel. The added functionalities and cost savings will impact what you’re able to mold and how much it’ll cost to mold it. During the manufacturing process, the first run-off of your plastic part ensures that the part meets quality standards and works as far as fit and function. In the future, we expect 3D printers will be efficient enough to replace an injection molding machine for small production quantities, which could eliminate the upfront investment required for molds and reduce the lead time for the first articles. FDM (fused deposition modeling) is the most commonly used 3D printing form. To create a 3D part using FDM, a thin string of plastic feeds into a heated tip (similar to a pen tip). The heated tip melts the plastic on contact, and then pushes the melted plastic onto the 3D printing tray in a certain direction to create a part. The plastic dries in layers as it comes out of the tip, and each layer dries quickly enough to hold the next layer—hence the term 3D additive manufacturing. While the majority of 3D printing is currently FDM, we expect that a number of additional 3D printing methods will be innovated in the next 5-10 years. The more forms of 3D printing available, the more options you’ll have when it comes to prototyping, mold-making, and manufacturing your part. Keep in mind, 3D printing won’t replace plastic injection molding for decades—if ever. While the 3D printing manufacturing process has evolved rapidly and will continue to do so, it will be many, many years before a 3D printer can match the volume, speed, and efficiency of a plastic injection molding machine. Currently, it could take roughly 30 minutes to print a 3D part that would take only seconds to make using injection molding. We look forward to watching the innovations in this space in the coming years—and passing along the benefits to our customers—but if you’re ready to move to production now, plastic injection molding is your best option. We’d love to answer your questions about our manufacturing process; simply fill out the form below or contact us and we’ll get a conversation started.